Property covered for non-paying and paying guests including Airbnb. Covers holiday homes empty for 30+ days at a time. Why is UK holiday home insurance important? Holiday homes, by their very nature, can often be left empty for long periods of time so you need insurance that takes this into account. A standard insurance is not sufficient to cover your holiday house. If you rent out your holiday home in the UK, you need a policy that is flexible enough for you to be covered while there are paying guests at the house. You also need to think about how your contents might be treated – visitors to your holiday home might not be as careful or considerate with your belongings as you are! Where they are, who is buying them and what they are contributing to the UK. 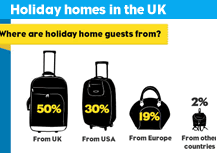 Find out more about UK holiday let properties! What properties are covered with our holiday letting insurance? Although you might think of your holiday property as a home from home for the summer, without you being there all of the time, it can often be at more risk than your main residence. Imagine if something happened, like a leaky pipe or a break-in, and you were none the wiser for weeks and weeks! HomeProtect offers one of the most flexible holiday letting insurance policies in the UK. While many other insurers prefer only to cover your main residence, HomeProtect has a range of inbuilt discounts to help meet your budget, including no claims discount. Get an online quote in minutes, and you’ll also get peace of mind that your holiday retreat is well looked after no matter what the UK weather brings! Standard home insurance is not suitable for a holiday home. A specialist holiday home insurance policy can protect your building, contents and provide public liability cover if you let the house out to paying guests. If you have a mortgage on your holiday home, UK law requires that you have buildings insurance. When specifying the rebuild cost of your holiday home, you should include outbuildings, swimming pools, tennis courts and hot tubs. With many years of experience in providing holiday home insurance UK, we’re sure that we can lend a helping hand when it comes to protecting your holiday property in the UK. You can tailor our cover to your situation with additional options such as legal support or added cover for specified items, like gadgets or art in the home. Public liability cover up to £5 million. Standard policy protects the property, outbuildings and fixtures and fittings against fire, storm, and escape of water. Loss of rent and costs of alternative accommodation. Domestic liability cover for accidents to staff such as cleaners and gardeners. 24/7 legal helpline: legal expenses up to £25,000 available for legal proceedings such as property damage. 24/7 home emergency cover available for emergency repair costs, the failure of mains services, leaking water pipes or a break-in – plus up to £200 per claim for labour costs and parts. Do I need specialist insurance for my holiday home? Yes. Most standard insurance providers are not prepared to cover holiday homes as they perceive them to be too great a risk. This is often because the property can be left unoccupied for more than 30 days at a time between lets, and because it is not a main residence. HomeProtect can provide specialist cover that fits around your needs, so your holiday home is protected all year round whether it is being rented to guests of left empty. Does your holiday home insurance cover properties abroad? No, we only insure properties in the UK. We can provide affordable home insurance for all sorts of circumstances. We can return a quote online in 97% of cases, saving you time and money. Can you cover my property if the house is left empty for long periods of time? Yes, HomeProtect is pleased to offer one of the most flexible unoccupied home insurance policies on the market. If your holiday home will be left vacant during the off season or between guests for more than 30 days, we can still offer cover. Good, simple and affordable insurance for holiday home. Very happy with policy and the company. Need UK holiday let insurance? Get a quote online, it's easy!